Well, my son has kept to his word and has been cooking a meal a day. He did take a day off for my birthday because we went out to eat, but on Monday my son made Pulled BBQ Chicken using the crock pot. For the dish, he put 3 boneless skinless chicken breast and 2 cups of in the slow cooker for 4 hours on high. After the chicken was done, he drained the water, shredded the chicken and poured a bottle of BBQ sauce into the slow cooker with the chicken and set it to low for 3 hours. He served it up in on GF buns and kettle chips. Yesterday he made Boy Scout Casserole. 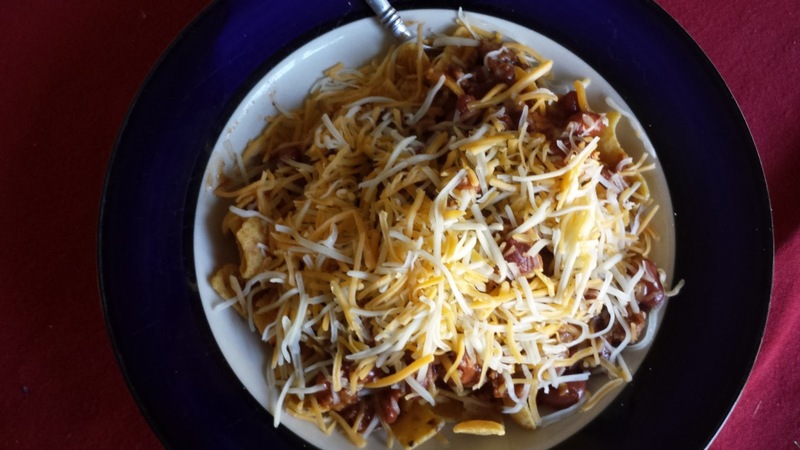 This was a simple dish... Chili with beans, Fritos, and grated cheese. 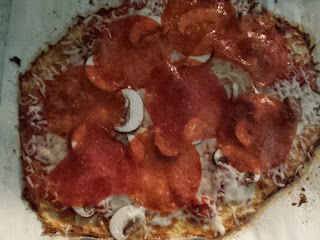 Today he made 2 pizzas with a cauliflower crust that was amazing! He used 3 cups of grated cauliflower, 3 eggs, and 3 cups of shredded cheese, the Mexican blend. He mixed those ingredients together, made two thin crusts put them a piece of parchment paper and baked them for 35 mins each at 425. After the crusts were done, he used pasta sauce, cheese, mushrooms, and pepperoni on top and then cooked it for another 10 mins. I have to say that my son has some MAD cooking skills!